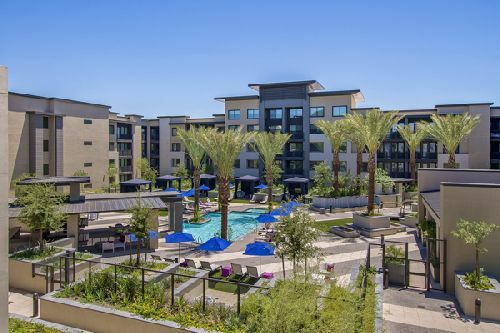 Broadstone Roosevelt Row, a new, 316-unit Class A, luxury rental community centrally located in the heart of Downtown Phoenix’s iconic Roosevelt Row Arts District, changed hands in an $84.2 mil ($266.5k/unit) transaction. The asset, located at 330 E. Roosevelt St, was acquired by AZ Roosevelt Row Apartments LLC – an entity formed by Weidner Investment Services Inc of Kirkland, WA. Part of one of the only true urban, walkable neighborhoods in Phoenix, Broadstone Roosevelt Row is steps from art galleries, restaurants, retail shops, bars and entertainment venues. The community offers a mix of studio, one-, two-, and three-bedroom floor plans at an average size of 865 sf. Each apartment features gourmet kitchens with gas cooktops, energy star GE stainless-steel appliances, quartz countertops, wood-style flooring, front-load washer/dryers in units, USB charging outlets and nest thermostats. Select units also include 19-foot ceilings, wine refrigerators, walk-in closets, Sonos sound system and personal balconies/patios. In addition to the surrounding/walkable amenity base, Broadstone Roosevelt Row features a pool and spa with private cabanas, state-of-the-art fitness facility with an outdoor yoga lawn, furnished rooftop deck with fire pits and barbeques, complimentary resident beach cruisers, smartphone resident access system, and a two-story clubhouse with chef’s kitchen, coffee bar, oversized TV, classic arcades and billiard games.